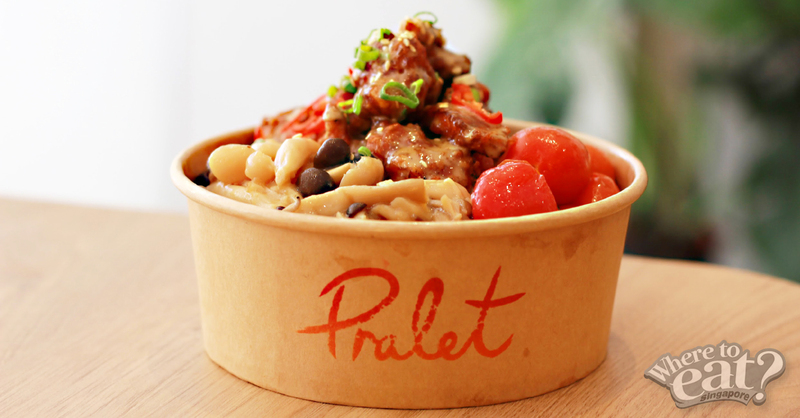 You’re looking to have lunch nearby and you stumble upon Caffe Pralet. Then, you think to yourself, wondering if it serves French food (perhaps because of its name), but it seems like a typical Western cafe. So what could it be? 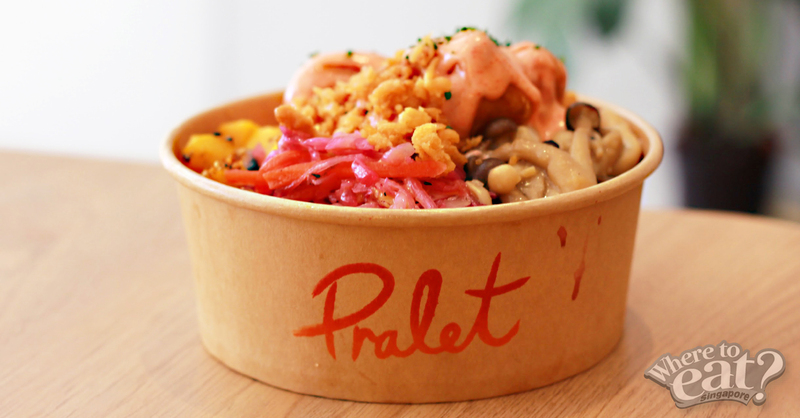 Having served Western food for quite a while, Head Chef Timothy decided to revamp Caffe Pralet and its menu – using rice bowls as its main concept for lunch. 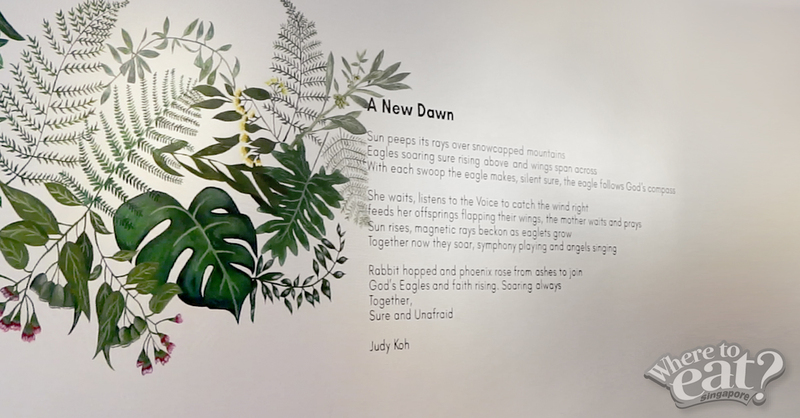 Walk into the newly-renovated cafe and you’ll see a pretty wall on the left – a poem written by its owner, aka Chef Timothy’s mum, Judy Koh, and a handpainted mural art. However, it’s not your typical healthy kind of rice bowls. Instead, it packs a wholesome set of flavourful ingredients where you can customize and make your own selection, filling you up for the rest of the day. And the delectable-looking rice bowls certainly sparked an interest with its vibrant colours and generous toppings. 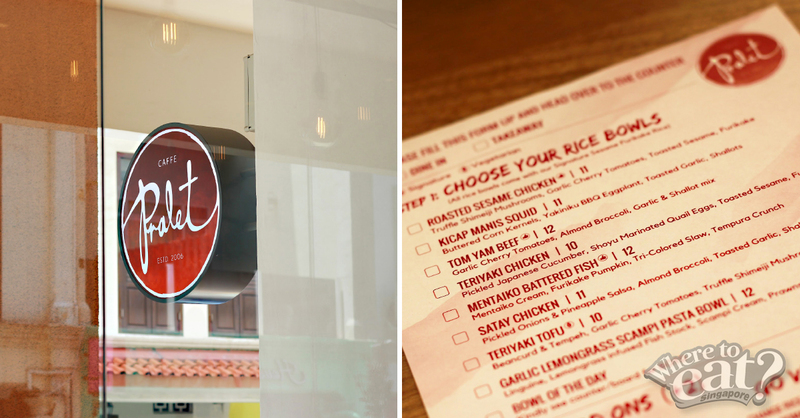 Because we were able to customize our own bowls, we decided to go for their Signature Roasted Sesame Chicken Bowl – replacing the usual rice option with salad instead. We were told that the sesame chicken were coated with their own mix of sauce, the same goes for the salad with their in-house dressing. Although heavily coated with sauce, the chicken pieces remained with a crunch. They were also much real as the bits were not overpowered with its coated flour. One thing we would like to highlight is the garlic-roasted cherry tomatoes that leaves an explosion of juices. Tip: We actually think you might like them better if you’d placed the whole tomato into your mouth before taking a bite. Yet another Caffe Pralet’s signature dish was the Mentaiko Battered Fish Rice Bowl, which happened to be our favourite of the day! Drizzling generously over the light and crispy dory battered fish was their own mix of mentaiko cream. Tossed in a light and simple dressing, the purplish Tri-Coloured coleslaw definitely not your average coleslaw. We have also added an extra topping – the truffle shimeiji mushrooms that were soft and pleasantly chewy. This time, we opted for the sesame furikake rice that brought a savoury umami flavour to the dish. So much of flavours in this beautiful one! The flavourful and crisp tau kwa that was fried with tempeh (fermented soybean) was an interesting combination! Stomach still screaming for more food? Grab some sides to share with your friends and you will soon understand why you shall hold no regrets! 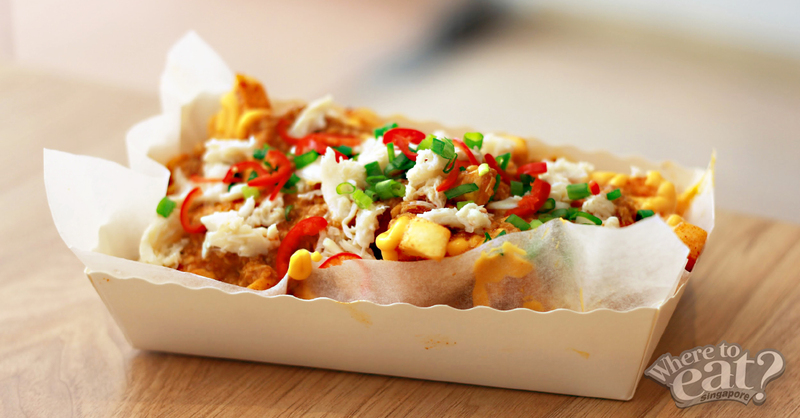 The Chilli Crab Cheese Fries is not a joke to play with – it packs a spicy bomb and contains a decent amount of REAL crab meat. Nevermind the spice, everything about it was just delectable! It may be a sinful indulgence for a side but we suppose everyday can be a cheat day? 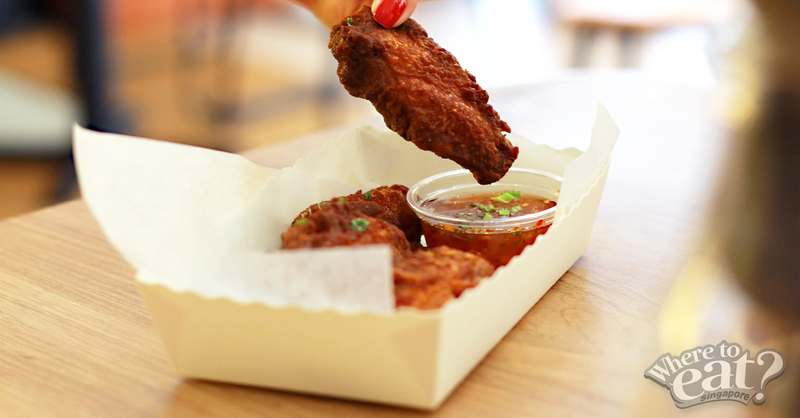 The well-marinated and crisp chicken wings invoked an amplified taste when paired with the Sweet Chilli Sauce. Having flipped through Judy Tan’s cookbook that was on display on one of its racks, the array of dessert recipes heightened our expectations for Caffe Pralet’s desserts. The Oolong Raspberry Cake and Chocolate Lime Mint Cake certainly did not disappoint us! The Oolong Raspberry Cake had a just-right balance of sweetness. 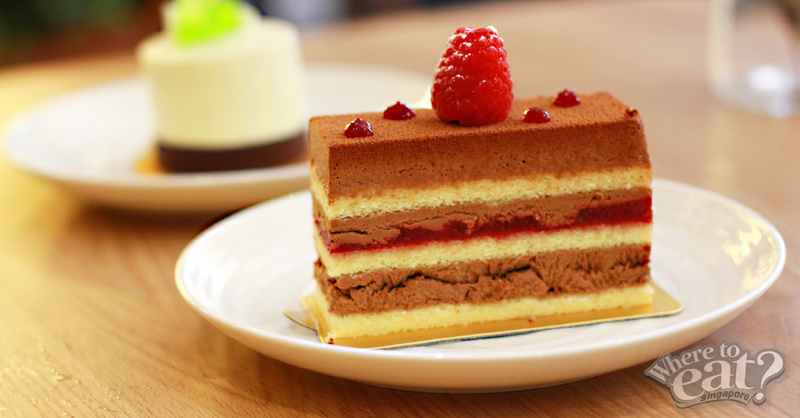 It almost feels like we are sipping on a fruity and rich milk tea, except it was in a cake form with refreshing raspberry sauces in between the slices. The Chocolate Lime Mint Cake is extremely light – the texture is akin to eating melted lime ice cream – that feels extremely shiok with its strong mint aftertaste. For its prices, the portion sizes are pretty much generous. It is not easy having to make everything from scratch, so kudos to Timothy for the efforts put into Caffe Pralet’s own sauces and mixes! 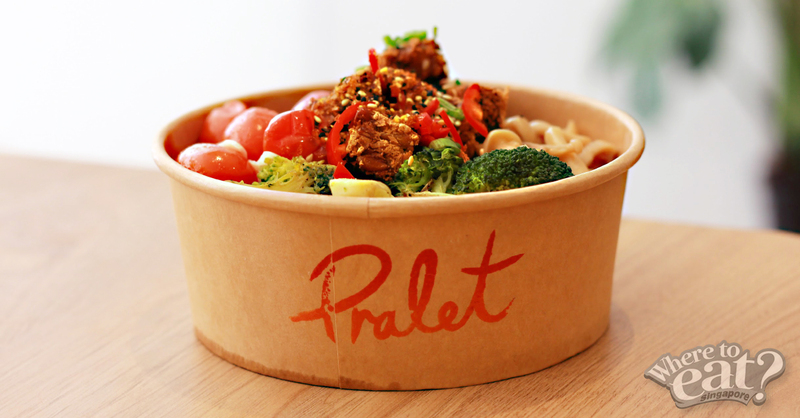 We would love to tackle Caffe Pralet’s dinner menu the next time.